Call A to Z Entertainment, Inc. today for free information about how to hire or book Gospel music singer Helen Baylor. With over twenty years of successful experience, we are your best agent and top talent agency for booking and hiring gospel singer Helen Baylor! We book or help you hire any live professional entertainment you want, to include – Gospel musicians, Gospel singers, and Gospel groups. We can also help you plan and produce your event, so call us at 888-655-4575 and we’ll be happy to help you. Gospel music and soul singer Helen Baylor travels throughout the country and the world conveying the message of God’s saving and healing power. She describes her concerts and performances as “a church service set to music.” Her music ministry has taken her not only to concert halls and churches but also to performing in prisons, women’s shelters and housing projects. Despite all her musical success, Helen Baylor turned to a life of substance abuse and broken relationships. After much soul searching, the prayers of her grandmother and a determination to remain sober, Helen Baylor joined Crenshaw Christian Center in Los Angeles, where Dr. Frederick K.C. Price was the pastor. For four years Baylor did not sing or perform Gospel music except for occasionally in the church choir. But, after six years of being grounded in the church, the desire to record and perform resurfaced. Only this time it was to spread the Gospel message! 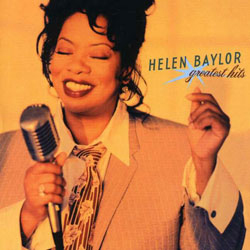 In 1989 Baylor recorded her first gospel music album, “Highly Recommended” on Word Records, this was followed by “Look A Little Closer”, “Start All Over” and, “The Live Experience”, which became her most successful Gospel music album and made her a favorite in the gospel music arena. The Live Experience was recorded before more than 7,000 enthusiastic fans at Crenshaw Christian Center, in Los Angeles. The CD was released in1994 and remained on the Billboard Charts for over a year, with 27 weeks at #1. The song, “Helen’s Testimony”, became a tool for leading hurting people to Jesus as she candidly shares her life struggles with drug addiction and proudly proclaims, “I had a prayin’ grandmother”. Baylor has gone on to release six more albums on the Word, Verity, Sony, and MCG record labels. During her Gospel music career, Baylor has worked with such industry greats as Bill Maxwell, Abraham Laboriel, Paul Jackson Jr., the late Billy Preston, Joe Sample, Tony Maiden, Justo Almario, Phil Driscoll, Marvin Winans, Denise Williams, Donnie McClurkin, and many others. Along the way, Baylor’s accomplishments have been noted by her four Grammy nominations, four Stellar Awards, two Dove Awards and one Soul Train Lady of Soul Award. She is also the recipient of an honorary doctorate degree, in Sacred Music, from Friends International Christian University in Merced, California. Helen has released an autobiography entitled “No Greater Love: The Helen Baylor Story”. We can help you book or hire any Gospel groups, musicians and singers. Having helped hundreds of clients, we are your best agency booking and hiring Gospel Music Singer Helen Baylor. Call us at 888-655-4575 today because we can provide you first-rate entertainers, musicians, bands, or singers of any type! A to Z Entertainment, Inc. is not the exclusive agency for any artist on this site.